Professional number crunchers have looked at the data and want to convince the coaches of their favorite football teams that they could win more games with a more aggressive approach. The information is out there. Over 96% of high school and college coaches have at least seen the articles. Some coaches (31.7%) are listening, believe in the evidence, and go for it more often. When looking at the group of coaches that responded to our survey, we found no difference in the winning percentage for the teams that were more aggressive versus the teams that played it conservatively. The NY Times quoted David Romer, author of 'Do Firms Maximize? Evidence from Professional Football' asking football coaches, "why not look into it?" We decided to ask coaches for ourselves. Here are the results. The most popular response of the “non-believers” was that there are psychological factors not taken into account. 30.8% of coaches believe that a non-traditional aggressive decision that goes the wrong way can have an outsized negative impact on the team’s mentality that will cause more damage than just a change of possession. 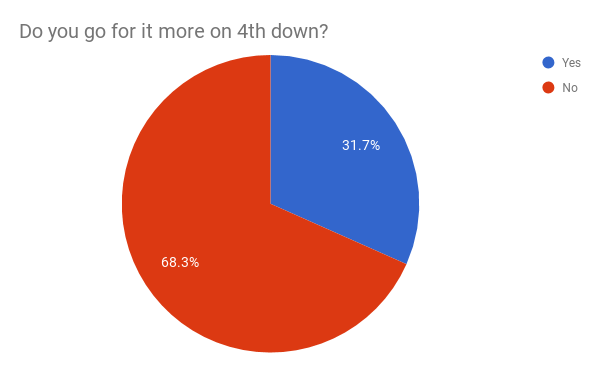 16.8% of coaches think that most teams should go for it more on 4th down, but they don’t do it themselves because their defense and special teams are great and are likely to play in a game where field position matters more than possession. 12.3% of coaches have heard the evidence and don’t think the math is right. When reading articles on 4th down decision making, two of the most commonly cited reasons for coaches’ reluctance to take a more aggressive approach are risk-aversion and peer-risk. Our survey results show that they are in fact the two least common reasons. Risk-aversion is when people don’t value gains as much as they fear losses. Risk-aversion would cause coaches to make a safer choice even though they know it is not the better choice. Peer-risk is when coaches want to make a more aggressive decision because they believe it will give their team the best chance to win, but choose not to because doing so would make them stand out from their fellow coaches. In the cases where it does not work out, it would be too damaging to their personal career. In our survey only 3.6% of coaches avoided going for it due to risk aversion and 1.4% due to peer risk. What Do College Coaches Love About Coaching?